In-bound citations are called forward citations. Forward citing documents are almost always newer than the documents they cite. Out-bound citations are called reverse citations. Reverse cited documents are almost always older than the citing document. In other words, let's say you have a patent. 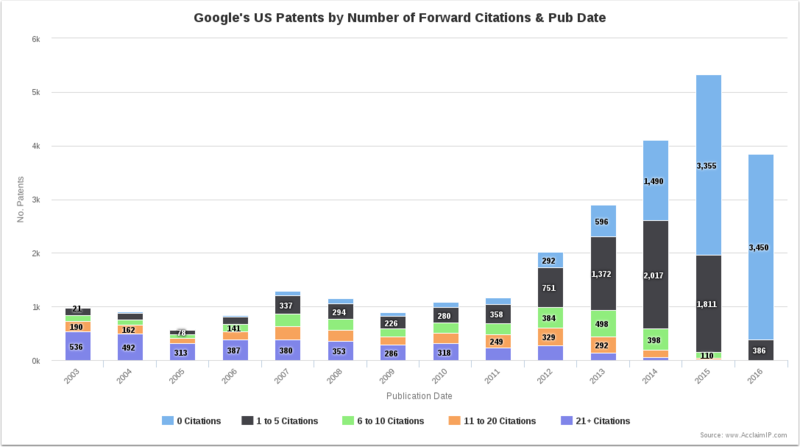 Forward citations are when someone cites your patent, and reverse citations are those other patents that you cited on your patent. You can search for documents that cite a document or a set of documents. You can further refine this query by searching only for examiner citations - that is, the citations that were provided by an examiner in a patentability argument. These are in contrast to those citations provided by the applicant in the form of an IDS. You can also search for documents by the number of citations they have accrued. Notice some of the field codes end in _CT, which stands for "count." The examples below show you how you can search for patents with a minimum number of total citations or examiner citations. To help make things as easy, the field codes are consistently named. If you remember FCITE and RCITE, and the two modifiers EX (for examiner) and _CT (for count), it will make it easier for you to remember all 8 field codes for querying citation data. FCITE (forward citations)--> Argument is a document number (or numbers). The result is a list of documents that cite the argument (document number). FCITE:(US8123456) --> Returns documents that cite patent US8123456. FCITE_CT (number of forward citations) --> Argument is a number (or a range of numbers). The result is a list of documents where the number of patents and applications that cite the document match the argument. FCITE_CT:[10 to *] --> Returns documents with at least 10 forward citations. FEXCITE (forward citations by examiners) --> Argument is a document number. The result is a list of citing documents where the examiner cited the argument (document number). FEXCITE:(US7184820) --> Returns documents where the examiner cited the '820 patent. FEXCITE_CT (number of forward citations by examiners) --> Argument is a number (or a range of numbers). The result is a list of documents matching the specificed number of examiner citations. FEXCITE_CT:1 --> Returns documents with exactly one forward citation by a patent examiner. RCITE (reverse citations) --> Argument is a document number (or numbers). The result is a list of documents that are cited by the argument (document number). RCITE:(US7123111OR US8123222) --> Returns documents cited by the '111 OR the '222 patent. RCITE_CT (reverse citation count) --> Argument is a number (or a range of numbers). The result is a list of documents where number of patents and applications that the document cited match that argument. RCITE_CT:[500 to *] --> Returns documents with 500 reverse citations or more. REXCITE (reverse citations by examiners) --> Argument is a patent or application document number (or numbers). The result is a list of documents the examiner cited when prosecuting the application referenced in the argument. REXCITE:(US20090022983) --> Returns the documents cited by the examiner during the prosecution of the '983 application. REXCITE_CT (reverse examiner citation count) --> Argument is a number (or a range of numbers). The result is a list of documents matching the specificed number of examiner citations. REXCITE_CT:[10 to 20] --> Returns documents where the examiner cited between 10 and 20 documents when prosecuting the application. Note: It might seem counter intuitive at first, but when you pull up, say, the FCITE:(US8123456) example, the documents in the results list will list US8123456 in their Reverse Cites tab of the Document Details window. This is because it is the list of forward cites FOR US8123456 (in other words, the list will be in US8123456's Forward Cite tab).